The ElliptiGO 8C has the versatility to give you the exercise experience you're looking for, whether you are a competitive athlete looking to improve your cardiovascular fitness or someone who wants to enjoy comfortable and fun outdoor exercise. It's a great tool for marathon training programs, for staying fit while rehabbing an IT band, stress fracture, or other injury, or for taking in the sights while you get your exercise. The 8C is our most popular model and the elliptical cycle with the best balance of performance and cost. Patented adjustable stride length enables riders of all sizes to share the same ElliptiGO. 8Speed Shimano hub enables 25 mph sprints and the gearing to climb the steepest hills. Patented Elliptidrive system provides for a comfortable, fun, lowimpact ride. Premier Ergon grips provide comfortable hand positions for hill climbing and long rides. ToughTrain 3.5 out of 5 It is effective and attractive bike. It helps to train yourself without much effect on your leg. It offers whole body training in a very reasonable price. *Note: Most of the sites, stores or shopping portals listed above sell ElliptiGO 8C with discounts and other exciting offers. There is a possibility that the some of above websites are not selling ElliptiGO 8C now. Toughtrain.com is not liable for such cases or instances. 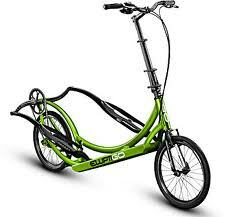 Also we do not recommend any seller for ElliptiGO 8C and a buyer should buy from where he/she gets best deal with quality of products, service and on time delivery (shipment).